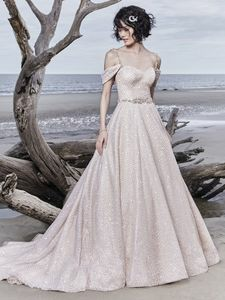 Description: A unique and whimsical upgrade to the princess ballgown, this dazzling wedding dress features shimmering crosshatch tulle over sequin tulle. Complete with sweetheart neckline and attached beaded belt comprised of Swarovski crystals. Finished with inner corset and covered buttons trailing from zipper to hem. Shimmering crosshatch tulle cold-shoulder sleeves attached to Swarovski crystal spaghetti straps sold separately.